FOUR YEARS AGO, in New York City, Chris Ajemian '97 and Charlie Veprek '00 founded 1863, inc., a theater company. It was, at the start, a weekend endeavor. Both founders held on to their day jobs, and with every new production, the theater's location changed. Today, when the two talk about the company, they describe it as "dormant," or "on hiatus." Their website lists "Current Projects," but the most recent event is a casting call from July 2003. As Ajemian and Veprek learned, there's no direct route to starting a theater company. The way that an aspiring impresario or group of stagestruck friends learns the requisite roles—artistic director and business director, office manager and fundraiser, usher, marketer, janitor, and labor mediator—is usually the hard way. Over the past 10 years or so, a handful of BC graduates have made the attempt. For some, it has become their life's work. WHEN AJEMIAN and Veprek first talked about starting their company, they laid out big dreams on a yellow legal pad. "It was going to be a four-story building," said Ajemian, who named the group after the street address of the off-campus residence where he'd lived as a BC student. There was talk of changing the name, said Veprek, but nothing better ever stuck. Over brunch in a Greenwich Village bistro one wintry weekend, Ajemian and Veprek reminisced about 1863, inc. With them was Michael Salerno '00, who joined the company in 2002. All three friends were BC theater majors; Ajemian was a teaching assistant when Veprek and Salerno took Introduction to Theater. From his book bag, Ajemian produced the wrinkled sketch that came out of the founders' initial brainstorming session—a document that Veprek had long presumed M.I.A. "The top floor would be for administration," Ajemian explained. "The next one would be rehearsal studios. There'd be two floors of performance space." "And there'd be a radio tower on top," Veprek recalled, smiling, "for broadcasts and radio plays." Their first production, an experimental, multimedia dance/theater/musical piece written by Ajemian entitled Negative Space, was performed at a site they found advertised on the Web as a "large performance area." It turned out to be the vacant third floor of a deli in Rockefeller Center, with jade-green tile floors, an overwhelming aroma of rotting garbage, and an eight-foot-wide faux-mahogany planter filled with potted plants that sat, too heavy to move, in the middle of the floor. "But it was free," said Ajemian. "All they asked for was half the box office." The show had two short runs: one at the deli, and another—a step up—at the Ontological-Hysteric Theatre, an off-off-Broadway black-box theater in St. Mark's Church-in- the-Bowery. The actors—who'd answered audition notices placed in Playbill Online and Backstage—were paid with one-month Metrocards, the only wage the founders could afford; Ajemian and Veprek earned nothing. The production received one good review on a website called OffOffOff.com, which praised the show as "an ingenious way to take what looked like a big eyesore at first and turn it into a beauty mark." There were no bad reviews published; in fact, there were no other reviews. 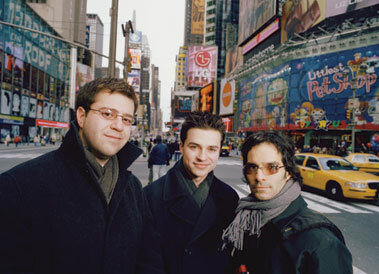 Over the course of the next two years, the two founders and Salerno raised thousands of dollars, mostly from friends and family, and produced five plays in reputable performance spaces like the HERE Arts Center in SoHo, and the Eugene O'Neill Theater Center in Waterford, Connecticut, where, after college, Ajemian had attended the advanced directing program. The three worked project to project, regrouping whenever creativity struck. "We had a million and one ideas for things we wanted to do," said Veprek, now a senior copywriter for the advertising firm Hill, Holliday. The group thought about writing a mission statement, he said, but dropped the notion as too confining—"we didn't want to rule anything out." From left: Charlie Veprek, Michael Salerno, and Chris Ajemian of 1863, inc. In addition to producing plays, they began a project to film all 154 of Shakespeare's sonnets recited at various locations around the city. (They shot 60 hours of footage before putting the film on hold; it now sits, unedited, in the back of Veprek's closet.) They looked into becoming a nonprofit corporation—the "inc." in the company's name being purely for show—but the required paperwork, lawyers, and board of directors changed their minds. "We didn't have enough profit to go nonprofit," said Veprek. 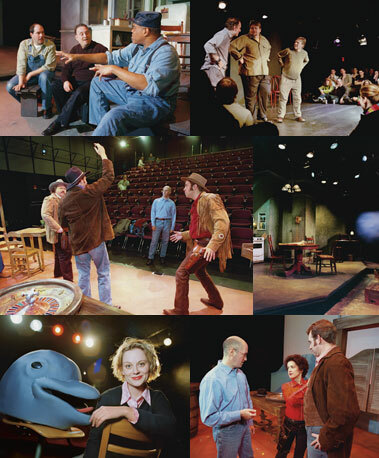 In late 2001, the company posted advertisements on Playbill.com, Craig's List, and in its own performance programs announcing the launch of a workshop for beginning and professional artists. One ad, designed by Veprek, was a handwritten note scrawled across an office telephone message pad: "You came here to be an artist. So be one." The workshop, convened at the O'Neill Theater, earned high praise from participants. Over the course of two years, nearly 70 writers, actors, directors, designers, dancers, and musicians from the New York community signed up, most of them young, struggling artists like the founders. During two-and-a-half-day sessions, attendees were divided into three groups; each would write a play in a day, then pass it on to another group to rehearse and perform the next. The idea, said Ajemian, is that "the participants see all sides of the theater experience. They create, perform, and watch." Gradually, though, the founders' outside lives got busier, and 1863, inc. projects became secondary; Ajemian signed a development deal to write a dramatic television series (as yet, unproduced) for Paramount Television; a promotion at work and a friend's illness absorbed Veprek's time; and Salerno entered Yeshiva University's Cardozo School of Law. Since November 2003, the 1863, inc. company has been idle, its principals meeting solely as friends. The three laugh when they talk about their bold ideas. "At one point, we'd dreamed up a whole campus," said Ajemian. "It was the long-term ideal." He hopes there will be another company in his future; Veprek and Salerno aren't sure. Now in their mid to late twenties, they all have other priorities, but as they point out, theater dreams die hard. "This was our first endeavor and we learned a lot," said Salerno. "It is incredibly hard to keep something like this going." PAUL DAIGNEAULT '87 and Vincent Lancisi '84 know precisely how difficult the struggle is. Each started a theater company in the early 1990s, and each has succeeded in keeping his stage lit. Daigneault's Boston-based company, The Speakeasy Stage, has spent the last 14 years in a small (142-seat) theater in the South End. On stage, the actors negotiate around two floor-to-ceiling steel I-beams, about one foot square. Designers find new ways to incorporate the pillars in every set. They've been palm trees, bookcases, a phone booth; last year, in Speakeasy's hit play, Bat Boy, the lead actor hung upside down from a "roost" suspended between them. Green-cushioned theater seats surround the stage on three sides, and if you sit near the wings, says Daigneault, the beams, located to the left and right of center stage, partially block the action. The theater, which is owned by the Boston Center for the Arts and leased to Speakeasy at a modest charge, poses an additional challenge in the winter. Speakeasy's marketing manager Jim Torres points out the old space heaters suspended from the ceiling. They run prior to performances, then are shut off just before show time. "I call them 'french fry lights,'" he says, turning on the gleaming orange elements with the flick of a wall switch. "Anyone who has sat under them knows why." Vincent Lancisi's 150-seat theater, called the Everyman, is in downtown Baltimore, about a block from the Amtrak station, and it occupies a former bowling alley. "If you were to look under the flooring," Lancisi says, "you'd find the old wooden lanes." His windowless office—a room he spends more time in than he'd like—is cluttered with mementos from plays he has directed: a leg cast from the 1998 production of Cat on a Hot Tin Roof, a poster of Everyman's first performance, in 1990, The Runner Stumbles by Milan Stitt (about a priest who falls in love with a nun). Everyman premiered in an old, gutted church without heat. An anonymous donor's $15,000 covered the rent, lighting equipment, sound equipment, carpentry, marketing, costumes, props, designers, cast, crew, insurance, and the script rights and royalties. Lancisi leased a propane heater to thaw the room before each performance. Eventually, he resorted to draping blankets over the folding chairs. By intermission, patrons were snug under the woolen wraps; by the play's end, Lancisi beams, most were still there. Both Daigneault and Lancisi began their companies in order to produce a single play. (For Daigneault, it was the musical comedy Is There Life After High School?) But each quickly developed a keen vision for the larger enterprise. 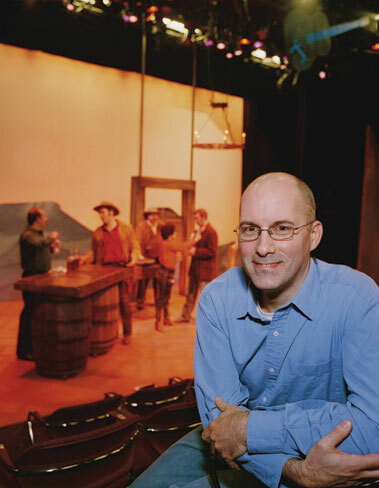 For Daigneault, the mission was to bring vital, cutting-edge theater to Boston. He wanted Speakeasy to be a theater of firsts, not only producing Boston premiers, but the unconventional work that more established Boston playhouses like the Huntington or the American Repertory Theatre might shy away from. Lancisi decided to produce plays with wider appeal, hoping to make theater accessible and affordable to the Baltimore community at large. As an undergraduate, he had spent a year studying in England, where he discovered the Everyman Theatre in Liverpool. Its mission: to make even the plays of kings speak to a general audience. "Theater should not be something people save only for special occasions," says Lancisi, pulling a brochure of his company from his desk drawer. "When they decide to go to the theater, most people open the paper, find the biggest ad for the biggest show, plunk down $75 each, and by the time they pay for a sitter, dinner, parking, they've blown $300. How often can a young couple afford that?" At Everyman, subscribers can see shows for as little as $10; walk-in tickets range from $13 to $28, depending on the day. In addition, the general public is invited to one pay-as-you-can preview of every production, and several Baltimore public high schools come regularly, free of charge, to special matinees that are followed by "talk back" sessions with the cast. For many Baltimore students, Everyman is their first theater experience; if their school stays with Everyman's program, they will see five productions a year, for all four years of school. Funding for this program used to come from the Baltimore Public Schools through a federal grant. Now the money must be raised by Everyman. Expenses for the program approach $150,000 a year—more than 10 percent of Everyman's total operating budget. Corporate and foundation gifts have helped, but every year, says Lancisi, the theater must dip into its operating costs. Lancisi spends more time fundraising than he does as a stage director. 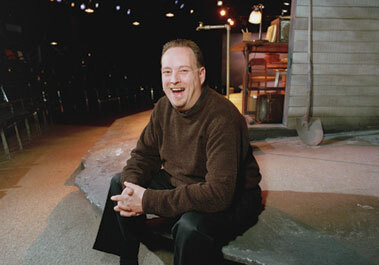 He directs two or three shows out of Everyman's five-play season; he works at development 365 days a year. "Even if we sold every seat to every performance of every production," he notes on the Everyman website, "ticket sales still would not meet the cost of producing the season." Over 60 percent of the theater's revenue comes from contributions. The company has a full-time development director and a special development council within its board. As a fundraiser, Lancisi shines, says Steven Leon, Everyman's managing director. "He loves telling people why he does this." WITH ANNUAL budgets of $675,000 and $1.2 million respectively, Daigneault and Lancisi have built their companies into successful nonprofit theaters. Each now runs a five-play season and maintains a large list of subscribers (900 at Speakeasy, 3,600 at Everyman). They've gained loyal full- and part-time staffs—including artistic directors, production managers, business managers, and marketing directors. But for the first six or so years, each ran his company as a one-man agency, juggling business and artistic concerns as the theater's only regular employee. Neither drew much—if any—salary; Daigneault temped at a financial service firm and taught in an after-school program, and Lancisi waited tables, to make ends meet. For years, their theaters relied on committed volunteers: actors, stage managers, set builders, techies. "There was a time I'd literally stand on the sidewalk with flyers, begging people to come in 15 minutes before the curtain," recalls Daigneault. "I had no budget to hire someone for publicity." Today, both companies are recognized as significant mid-sized theaters in their cities. Everyman is one of the few regional theaters to keep its own resident company—a group of nine professional actors, directors, and designers who work on at least three productions a season. Speakeasy, smaller and younger by two years, has recently gained access to a more prominent venue, the Calderwood Pavilion. Run by the Boston Center for the Arts and Boston's Huntington Theatre, the new South End facility contains two state-of-the-art theaters, two large rehearsal rooms, and a bi-level, modern lobby. Speakeasy and four other resident companies have rental privileges. For both Daigneault and Lancisi, the guarantee of a consistent space for productions has been key. "One of the big challenges is branding your company," Daigneault explains. "People associate a company with a location—they don't necessarily pay attention to the words 'So-and-So Presents' on the front of a program." They won't chase you all over the city, he says. "And they don't write a lot of checks to 'homeless' organizations." Neither Speakeasy nor Everyman has ridden smoothly through a decade marked by drastic cuts in corporate and government arts funding. Several years ago, for instance, the Massachusetts Cultural Council, a reliable Speakeasy contributor, saw its allotment from the state slashed by 65 percent. A comparable cut in Speakeasy's support followed. At one point, the ebbing tide almost pulled Lancisi's Everyman Theatre under. In 1994, three months after the four-year-old company moved into its new space in the renovated bowling alley, Everyman found itself $18,000 in debt after the season's first play. The rest of the season was canceled, and the five-member board met to address the bleak future. Lancisi still winces when he mentions the crisis. Recalling the factors that led to it, he pulls at his goatee: There was the high cost of renovation and the accompanying maintenance of the new building; a delayed $10,000 donation; and a very low audience turnout owing to the fact that few Baltimoreans knew where to find the theater in its new location. "We played some nights to 10 people," said Lancisi. "We decided if there were ever more people on stage than in the audience, we'd cancel the performance." It happened on more than one occasion. Lancisi described the board's hours of painful deliberation. At one point, someone pulled a bottle of Scotch from a brown paper bag, anticipating a sad toast to the theater's end. But by the time they reached the bottom of the bottle, Lancisi and the board had decided to stick it out. Productions were put on hold for a year while the board recruited new fundraisers, and within a year—to even Lancisi's surprise—Everyman offered its first full season of plays. NOT EVERY new theater faces the same uphill battle. The Upright Citizens Brigade Theatre (UCBT), cofounded by Amy Poehler '93, has been in New York City just six years, and on weekends, a mostly under-30 crowd lines up around the block three hours before show time. Many are regulars who attend as faithfully as others might a cult film like The Rocky Horror Picture Show. They know the theater managers and interns, which seats have the best views and which ones wobble, and refer to performers by first name. Poehler became a celebrity when she joined the cast of Saturday Night Live (SNL) in 2002. She cofounded UCBT in 1999 with Matt Besser, Matt Walsh, and Ian Roberts, fellow members of the Upright Citizens Brigade, the comedy group that the four had formed a few years earlier while performing at Chicago's famed ImprovOlympic. The troupe had left Chicago for New York, and in 1998 their act had earned them a three-season television stint on the Comedy Central channel (the show was titled Upright Citizens' Brigade). Ruing the absence of "Chicago-style" long-form improv in the city, they used their reputation and income from Comedy Central to start their own for-profit theater. "For-profit might be a bit of an overstatement," said Poehler in a telephone interview from her home. Though the theater is now a $1 million operation, "no one gets paid to perform here, and the little bit we make we put back into the theater," she said. "We want the space to be filled with people like we once were: young, broke, and full of dreams." Poehler and her cofounders carved their first theater out of a pink-walled storefront that had once been a burlesque club, in Manhattan's Chelsea neighborhood. Their new and improved space is a dank basement theater just a few blocks away, beneath a Gristedes supermarket and next door to a McDonald's. "We keep asking McDonald's not to roll their trash cans through the halls when we're performing," says Alex Sidtis, the 26-year-old UCBT general manager, "but they always do it anyway." Ticket prices at UCBT never climb above $10, and, at late-night shows, a can of Pabst Blue Ribbon sells for $2. The house seats 150—more on busy nights when patrons sit crowded up front on the floor. 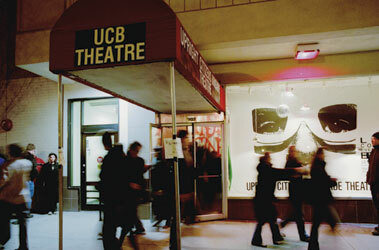 To generate enough revenue to sustain itself, UCBT runs two to five shows per night seven days a week; offers a touring company (with some of the theater's best talent) that can be hired for and tailored to special events on college campuses, business functions, and festivals; and, for a $300 tuition, holds improv classes for aspiring comics. The theater is staffed by six full-time employees and 30-plus interns—all of whom work for free classes, acting experience, and a chance to enter the world of comedy. UCBT has become the mecca of East Coast improv. Its shows attract television talent scouts from SNL, The Daily Show, Late Night with Conan O'Brien, and the Late Show with David Letterman. On Sunday nights at 9:30, UCBT becomes a playground for television comedy writers and stars who drop by for unannounced guest appearances. SNL's Tina Fey, Horatio Sanz, Rachel Dratch, and Seth Meyer often show up for the improv showcase, along with UCBT's cofounders. "This is, by far, the thing I am most proud of in my professional life," says Poehler of UCBT, "much more than anything I've done in television or film. People do this truly for the love of it. And that's what makes it satisfying." On a recent Sunday afternoon, the audience is sparse. Only about 20 seats are occupied for a "graduation showcase" by an improv class of beginning comics. When the house lights go down, a voice booms over the loudspeaker—at a higher decibel, even, than the Guns N' Roses that has been blasting since the audience came in. "How many of you here are friends or family?" the voice asks. Everyone in the audience shoots up a hand. "How many are here because you lost a bet?" All hands rise again—this time more ardently—and a heckler calls out, "You shoulda seen the other guy." As the lights and music go down, the students walk on stage, one by one, each with a well-practiced, "off-the-cuff" comedic offering. The next hour will see a fledgling attempt to execute The Harold, the long-form improvisation technique UCBT imported from Chicago, developed by the revered mentor of improv, the late Del Close. ("It needed a name, so Del gave it one," said UCBT's manager, Sidtis.) The performers ask the audience to suggest a topic, then in pairs they improvise scenes, one after another, until they've created a veritable play. For beginners, that means a series of underdeveloped characters, unconnected scenes, and lots of dead air. When the professionals perform it later that evening, it will mean 90 minutes of unblemished hilarity. IMPROV, LIKE live theater's most formidable competitors—television, movies, and video games—provides the fast-paced, low-priced amusement that easily draws a young audience. Both Daigneault and Lancisi know the bottom line: They too need to attract young audiences, or in a generation there will be no one to buy tickets. Both have tried—Lancisi through his educational outreach efforts and Daigneault through his progressive programming. Small theaters have a special role to play in advancing a theater tradition in America. In terms of developing new art, says Ed Siegel, theater critic for the Boston Globe, "Americans can no longer look to Broadway, or, in many cases, even larger regional theaters, to discover and produce new work. Plays that make their mark often start on the small scale, and it is the regional theaters who do that risky work." And, Siegel points out, it is often the small theaters that people can afford to attend. Ajemian, Veprek, and Salerno, Daigneault, Lancisi, and Poehler can attest to the demands and risks of starting a small theater. When asked if he would do it all over again, Lancisi answered this way: "The best advice I ever got was from a professor in the BC theater department, the late J. Paul Marcoux. 'Before you choose a career in theater,' he warned, 'try to find any other occupation in the world. If you can find one that makes you happy, stick with it. If you can't, then welcome aboard. Prepare yourself for very rough seas.'" Cara Feinberg is a freelance writer in the Boston area.